— Daily Freeman-Journal photo by Anne Blankenship Dale Arends discusses the upcoming Webster City Community Theatre production of “All My Sons.” an Arthur Miller play. Arends has dreamed of seeing the show staged since he worked backstage for a high school production more than 40 years ago. Arends plays the lead, Joe Keller, in the WCCT production. 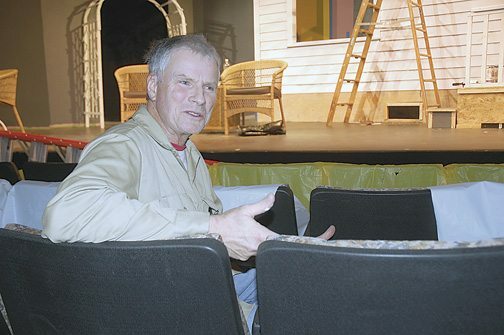 Patrons of Webster City Community Theatre will have a chance to see a classic of the American theater this winter and at the same time, one actor will realize a dream he’s had since high school. “You can lay this on me. Ever since I’ve been involved in theater as an adult, whenever people in community theater have asked ‘What show should we do,’ I’ve suggested this,” said Dale Arends. “This” is Arthur Miller’s “All My Sons.” First produced in 1947, the play is based on a true account of an incident in 1941 to 1943 when Wright Aeronautical Corporation based in Ohio, had conspired with army inspection officers to approve defective aircraft engines destined for military use. In Arthur Miller’s story, the character Joe Keller is accused of knowingly shipping damaged airplane parts that led to the deaths of 21 servicemen. While only his business partner, Herbert Deever, was convicted of the crime, Keller was guilty as well. When the truth comes out, it only adds to the scars each character has received from experiences during the war. Arends, of Rowan, said he first saw a production of the play in high school. Though he wasn’t selected for the cast, Arends did get involved with the show by helping to build the set and worked backstage during the show. Even from back stage, as the eventful ending scene of the play arrived, he could feel the dramatic impact that the moment had on the audience. “That always stuck with me. It’s something I’ll never forget,” he said. Through the years, every so often, he would reread the script, hoping to find a way to stage a production. Arends said “All My Sons” is a risky show and a stretch for both the actors and the audience. The themes expressed in the play range from guilt and blame, to responsibility and honesty, from deceit to justice and courage. It’s not a show that every community theater would try to undertake. Arends considered directing the show himself, but truly wanted to be in the cast. He talked to Abby Sharp who jumped at the chance to direct the production. It’s not her first venture into highly dramatic works. She directed “12 Angry Men” several years ago for WCCT and tackled “Nevermore,” based on Edgar Allen Poe’s works. She’s assisted by Trese Arends. Arends was cast as Joe Keller, the patriarch of the Keller family. The cast also includes Loween Getter as his wife, Kate and Brennan Fehr as Joe’s son Chris Keller. Newcomer Lynda Wunder-Heidt plays Ann Deever and Kevin Sharp has the role of George Deever. Nichole Ose plays Lydia Lubey and Brian Borkowski is Frank Lubey. Dean Evans was cast as Dr. Jim Bayliss and Christine Hassebrock, another newcomer, plays Sue Bayliss. Hank Christeson is Bert. Sharp said the ensemble is working well together, taking great care as they tackle the difficult themes in the show. The production drew cast members from not only Webster City, but many surrounding communities including Fort Dodge, Humboldt, Rowan, Duncombe and Woolstock. Arends said he’s thrilled to be part of the production, culminating his 40-plus year wait to see the show staged. “I think we ended up with a really great cast. We’re fortune that the people who auditioned, did,” he said. The production will open on Feb. 2 and will run Feb. 3, 4, 9, 10 and 11 at WCCT. Ticket information will be released in the coming weeks. “All My Sons” marks Arend’s 12th production. He’s doesn’t have any other parts specifically on his bucket list, but looks forward to more shows with WCCT. “I enjoy being in shows and there are always interesting parts to play,” he said.